100% Jersey Tomatoes! All Natural, No added sugar, lower salt, gluten free. Continuing a tradition of quality our pasta sauces are made with the best New Jersey tomatoes and tradtional ingredients for a full, balanced flavor! Johnny C's favorite Marinara Sauce. 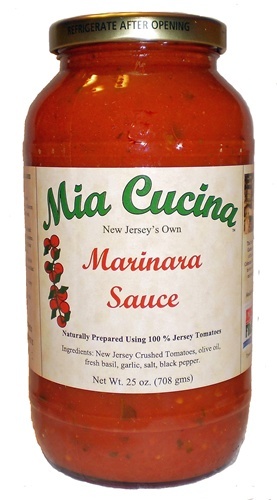 Mia Cucina Marinara Sauce is our own Marinara that is made exclusively from World Famous New Jersey Tomatoes. Made the way grandma would with garlic and fresh basil, Mia Cucina's Marinara Sauce has a fresh tomato flavor not found in any other product. Thanks to the locals! Nothing comes close to the low sodium of Mia Cucina Marinara Sauce! How is this not the approved sauce of the American Heart Association? The one that is "approved" has more than double the amount of sodium. Thank you for providing such a delicious, and heart healthy sauce. I have the Merlot waiting to be opened and will be getting the Fra Diavolo as well!